School of Management alumni and guests joined our Chancellor, HRH The Earl of Wessex KG GCVO, for his first visit to the University of Bath in London. 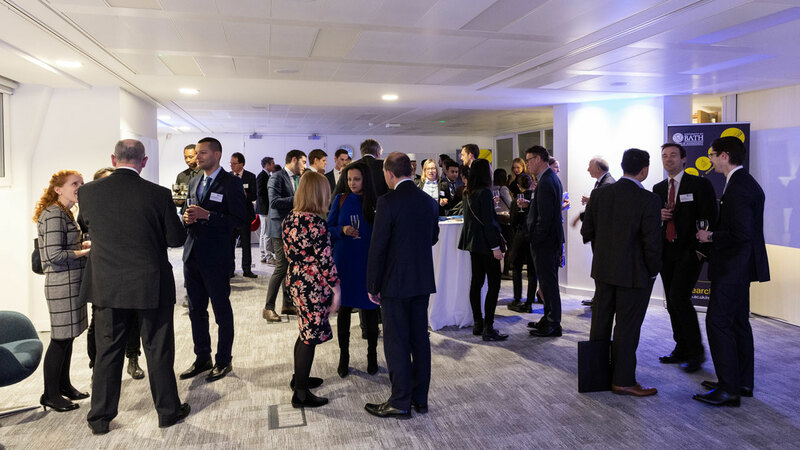 More than 60 School of Management alumni and their guests joined our Chancellor, HRH The Earl of Wessex KG GCVO, for his first visit to the University of Bath London premises on Tuesday evening. The Chancellor spoke to guests about the University’s continued investment in improving student outcomes together with corporate and community engagement, enabled partly by facilities such as the School’s new home beginning to take shape on campus, the Virgil Building, 10West and the new Milner Centre for Evolution. The Chancellor also highlighted the School’s Research4Good Campaign as just one of the ways that business can make a positive impact on the lives of people, communities and economies around the world. Research4Good uses evidence-based management research to influence future infrastructure and policy, such as introducing procurement initiatives that have saved the NHS £45million a year. Professor Veronica Hope Hailey, Vice-President of Corporate Engagement & Dean of the School of Management, began by tackling a tongue-twister - the subject of the evening’s conversation: Digitisation. Digitalisation. Digital Transformation. As Professor of Strategic Change & Transformation, Professor Hope-Hailey reflected that while she was prepared to partially tackle the subject, she was calling on a digital expert to assist her – Nick Hynes (MBA Executive 1991). Nick‘s highly successful digital business ventures include his role as CEO and Founder of The Search Works, Europe’s largest search marketing company; and President, CEO and Founder of Overture Europe, the paid search industry pioneer in Europe & East Asia. Nick’s current venture, founded in 2009, is Somo Global: a digital products and experiences accelerator which has aided and amplified the digital offerings of a variety of companies from Audi to HSBC to LVMH. In his role as CEO, Nick defines the overall strategy, recruiting the team, and shaping the culture of Somo. Digitisation: making all current offline processes available and accessible digitally online. Digitalisation: considering how to apply digitised information to simplify and improve specific operations. Digital Innovation: putting the customer first by developing processes that integrate all the digitised data and digitalised applications and develop new products and services to meet customer need. Digital Reinvention: how can we make everything better? The wholesale reimagining and reinvention of how businesses operate, enabled by today’s advanced technology. The really exciting stuff is the digital reinvention. This is the stuff that I first learned about when I was doing my MBA. It’s about creating new marketplaces […] actually to look at creating a new market space. Radical decreases in the price of digital tools has meant that these items are more easily available to the everyday consumer than ever before. This has enabled a significant number of customer-centric start-ups to appear – each looking to address a single point in the customer journey. This rise has caused a massive disruption to the corporate status quo; since the early days of the world wide web in 1995, only 37% companies who were in the Fortune 500 at that time remain there today. Digitally-focussed mega-companies like Google and Netflix are among the 312 new companies that have entered the Fortune 500 in that period. Nick says it’s simple; what you are doing today in business may not be your business for the future. Companies – and their workforces – need to remain open to the idea of transformation. The challenge facing modern day business is undertaking a digital transformation of their organisational structure and culture in line with the digital transformation of their product. The old-style “command and control” management structure is ineffective in a digital age – the new way of working needs to be self-managing, cross-disciplinary and agile. The success I have achieved through the massive pace of change in the internet industry and the digitalisation of our whole world has been fundamentally supported and guided by the methodologies I learned about being a great manager at the University of Bath. Amidst the excitement of looking forward, Professor Hope Hailey and Nick called on the audience to understand the benefits of reflection in business. Agile thinking and working calls for learning and experimentation – which may result in failure. The successful digital entrepreneur distinguishes themselves by embracing failure as an opportunity to reflect, understand and improve. Everything you face, every challenge, every opportunity is because of some other previous action. So reflect on that, understand that, and then understand and be brave with how you can change that current state to be a better place than it is today. Professor Hope Hailey thanked Nick and concluded by inviting guests to take a look at the plans for the School of Management development and to visit campus to see the rapid progress underway. The School’s Change Programme will enable joint working and inspire partnerships between students, academics across the University and corporate partners, fostering entrepreneurial thinking that will establish the School of Management as an anchor point in the local and regional business community. The new School of Management will emphasise this partnership between employers, faculty and students – and alumni as well.